The winds of change are blowing in the smart phone world. Apple is no longer the world’s second most successful smart phone manufacturer. 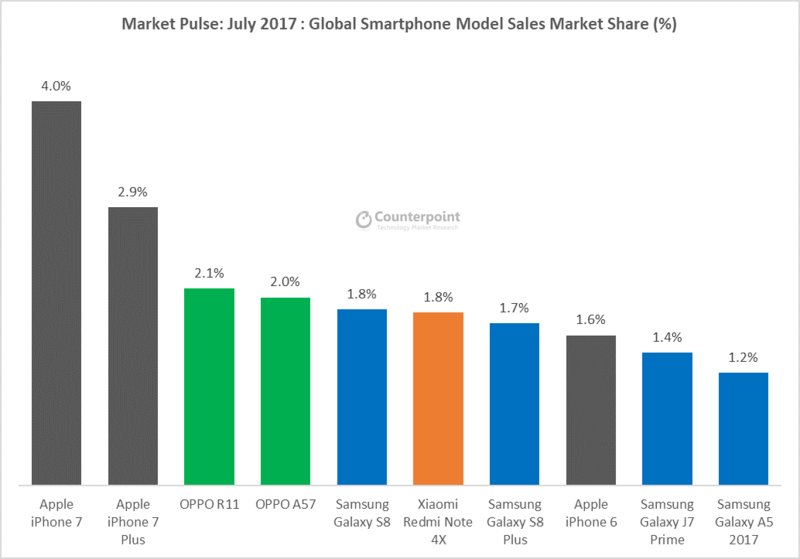 Huawei have sold more phones than Apple in June and July of 2017. This leaves the Chinese tech giant second only to Samsung in terms of sales. The figures aren’t available yet but the trend looks set to continue into August according to counterpoint who conducted the study. The boost in sales seems to be down to Huawei’s investment in R & D and manufacturing as well as aggressive marketing campaigns. This has allowed Huawei to gain purchase in markets outside of China. Including Europe, Latin America and the rest of Asia. This strong market share is why Huawei have sold more phones than Apple over the last couple of months. This plays into a larger trend for Chinese manufacturers. Brands like Huawei and Xiomi have both seen rapid growth over the last year or so. With Xiomi seeing huge sales growth over the last quarter. Chinese manufacturers have also gained access to a number of key supply chain partners. This is allowing them to produce in-house chipsets and include features like bezel-free displays that allow them to compete toe to toe with giants like Apple and Samsung. In Huawei’s case clever marketing partnerships have helped them secure some of the best devices on the market. The collaboration with the German camera manufacturer Lecia has proved particularly successful. It has culminated in the P10 having one of the best cameras on the market. Mostly thanks to close collaboration on the software that processes your shots. Huawei have sold more phones than Apple but they don’t yet have a single phone in the top ten. This points to a weakness in Huawei’s strategy. For a long time they focused on a large number of handsets to appeal to a wider audience. This is a problem for Huawei who will need to improve brand recognition to keep growing. It seems that the Chinese manufacturer understands this. Over the last year Huawei have trimmed down their lines to concentrate on core devices. The Mate series for phablets, the P9/P10 series for high end phones and the honor series for mid-range devices. The company has also stated that it will be leaving the budget market to concentrate on premium handsets. Unfortunately for Huawei counterpoint believe that their moment in the sun will prove to be fleeting. 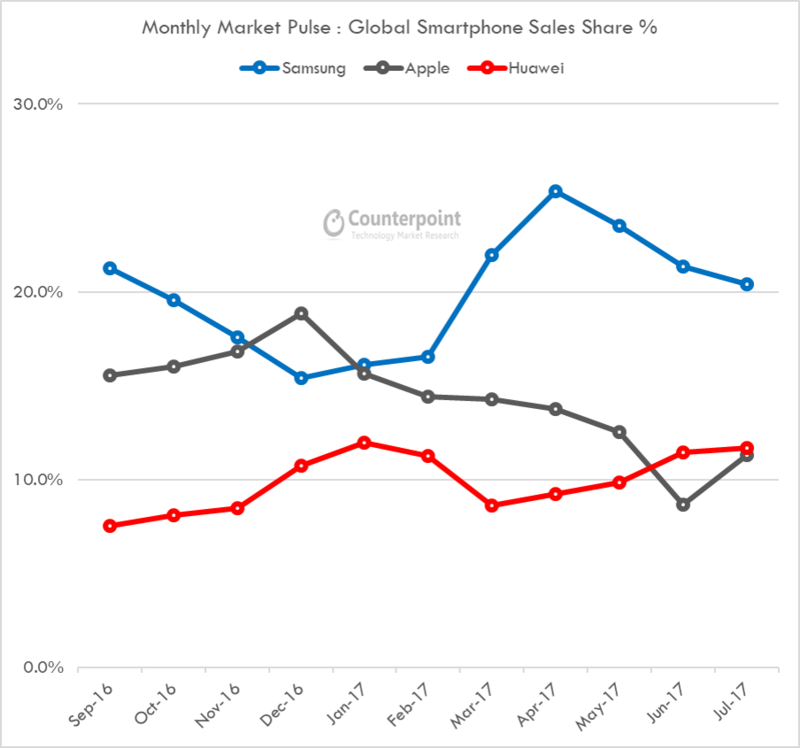 They argue that the release of the iPhone 8 will lead to a reduction in sales for Huawei, putting Apple firmly back in second place. Normally this would be the case but I wouldn’t count out Huawei just yet. Back in July Huawei CEO Richard Yu went out of his way to set up the Mate 10 as a competitor to the iPhone 8. According to him the new device will have better battery life and take better pictures than Apple’s offering. Huawei have even moved up the product’s release cycle to September in order to directly compete with the iPhone 8. Given the huge popularity of iPhones it might seem counterproductive for Huawei to try compete with an Apple launch but it makes a strong statement. It shows that the Chinese manufacturer now considers itself to be big player in the market. It could also help Huawei build their brand further by playing up a rivalry with Apple and offering themselves as a better more innovative alternative. Previous Good Range, Smart and Affordable, is it possible that the new Nissan Leaf is the future of electric cars? Apple MacBook Air vs. Microsoft Surface Book: Battle of the Giants!